Tonight is the 66th Primetime Emmy Awards and one of the best in U.S. primetime television programming writer for the "Mad Men" series, Tom Smuts, his wife and friends are getting there in a way most people wouldn't expect. Nope, not by helicopter or a private jet. Not by a fancy limo or driving a car. Bus? Nice try. They are riding their bicycles to the ceremony! In stylish evening attire, mind you. Tom is a bicycle commuter and the idea came out of "playful activism" on all of our behalf. As you can imagine, traffic around the event venue tonight is going to be absolutely horrible L.A. traffic multiplied by 10!! I enjoy watching the "Mad Men" series on Netflix and now I like the show and admire the writer even more. His wife who is executive producer of the "Homeland" t.v. series is also riding to the Emmys, along with a few other women. Like me, he just wants to show drivers that bicycle commuters are also people. That you really can bike everywhere! And by cycling you can be a part of the solution instead of the problem (traffic congestion). And that you CAN wear just about anything -- even formal attire to big social event! He said to the Hollywood Reporter, "A group of people dressed appropriately riding to the Emmys sends a message about the kind of people who commute on bikes." and "It might make drivers more aware that we're not hooligans trying to lengthen their commutes." Read the full article on the Hollywood Reporter. I hope all goes well for the group ride to the Emmy Awards!! With the 17-mile route between Tom's home and the Nokia Theatre planned by the Los Angeles County Bicycle Coalition and the support of the city government's Bicycle Advisory Committee, the mayor's office and the TV Academy it sounds like everything will go as smoothly as possible. I don't have cable television but I hope to catch a glimpse of when the six riders roll onto to the red carpet in the media coverage!! ESPECIALLY of what the ladies are wearing which will be Tom's wife, Meredith Stiehm, and cycling fashion designer and activist Nona Varnado. Now if I were going to the Emmys on a bicycle, I would have a really tough time deciding what to wear!! As if it isn't hard enough to decide what to wear to an event like this, right?! But these outfits below will work as long as they allow for leg movement to pedal comfortably. I would wear shorts like Sarah Hyland or Taylor Schilling. The bandeau top under the chiffon shirt is also great for ventilation. Photos are from the Hollywood Reporter Emmy Parties. And ride my bike to the Emmys in heels?? Heck yeah!! Or I would stow the heels (and jacket) in a pannier bag. Or I'd wear a dress with slits like Betsy Brandt. Even Julia Louis-Dreyfus' dress will work if the placket underneath the zipper is stretchy or unfolds like Betabrand's Bike to Work Skirt (which I absolutely LOVE). 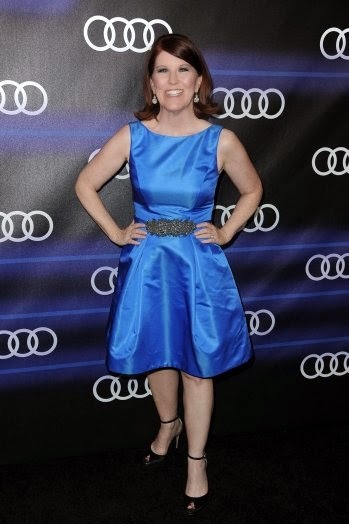 Or I'd wear a dress with a fuller bottom, like Kate Flannery. The sleeveless arms also allow for air circulation! !